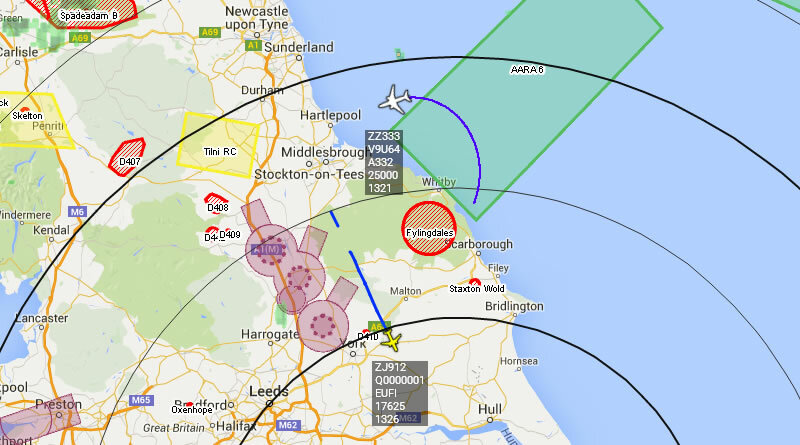 At around 2145L I reported that QRA Typhoons had launched from RAF Coningsby. This turned out to be a genuine QRA not a practice. The lead Typhoon was visible as it took off from RWY25 flying West between RAF Waddingon and RAF Cranwell, then turning North West flying over Doncaster Airport & Leeds. Then reports of the Sonic boom came in from this area and several surrounding counties. Mode-S Signal from the lead Typhoon ZJ912 stopped and ZJ911 popped up on screen not long after. The tanker was scrambled to support and flew North. We believe that they were scrambled to intercept a Civilian Aircraft and escorted it into Newcastle Airport: “We can confirm flight AFR1558 from Paris, Charles De Gaulle was escorted into Newcastle Airport by RAF aircraft having lost communication with Air Traffic Control. The aircraft landed safely at 22:23,” Said a Newcastle International Airport Spokesperson. Lead Typhoon is now believed to be back at RAF Coningsby and the Tanker is currently making its way down the East Coast nearer its home. It is worth saying that Quick Reaction Alert Aircraft are here to protect our UK Airspace. Due to them having to get somewhere urgently they can be authorised to break the Sound Barrier over Land, when this happens it is common to hear a Sonic Boom across several Counties without notice. Whenever we report on QRA launches we always state “QRA/Practice QRA” as we don’t know for sure if it is genuine or a practice. Authority to break the Sound Barrier is usually reserved for the real deal so that was the first good sign it was a genuine. Also apologies for our website being unavailable, when we tweeted the link over 10,000 people used it at once, something we don’t have the logistics to test for beforehand, as you can imagine! Special thanks to 360Radar who provide our primary aircraft tracking and where we get most of our screenshots from. More information on how to get involved is here! if this was a practice it was obviously planned so why was it done at such an unsociable and inconsiderate time? I was asleep alone in the house and woke thinking someone was breaking in. I’m sure I’m not the only person that was alone and frightened. My elderly neighbours were shaken too! I understand the need to practice but perhaps consideration for the number of people it would affect across all the relevant counties should be given more than a passing thought! Awake and grumpy from Leeds! Wasn’t a practice – Was a genuine emergency. I doubt that they would plan a QRA at this time of the night and allow them to go supersonic! Do you complain loudly when an ambulance or police car goes past with the sirens on? Or assume that they’re just practising. Common sense, please? Can’t believe anyone would give you flak for such an appropriate and well considered response to something that might’ve got a whole lot worse. Well done to all involved and please ignore those who have enough time on their hands to complain! Good to know that you guys can respond so quickly! Haha, you taking the pee? This was absolutely not a practice. The pilots in the civilian plane were unresponsive for around 7 minutes pause they were way off course as to where they were supposed to be! it was a genuine QRA and they had been given permission to break the speed of sound. Be grateful that they were so responsive and to act so fast! Same in Harrogate ! 2 boom and heard plane going over . The whole street people come out of there’s houses scared so much . What was this ? I suspect aux elec failure, radio/lights out, pilot headed for sea while attempting to make NCL. Course deviation and radio silence resulting in response. I’m really interested in the screenshot you posted, is this something I can subscribe to? It looks like Planeplotter with custom overlay and map to me. Glad the RAF sorted the issue out promptly. Fed up of seeing those on twitter saying the RAF should issue an apology for causing the sonic booms over Yorkshire. If anything, they should be grateful! Would prefer to be woken up, knowing that the RAF are dealing with a sensitive sortie! Very comforting to know that we have this sort of response. The booms were amazing. I love just to the east of Leeds. What a fantastic job you do, 1st I’ve ever seen this happen in our air space, comforting to know what goes on to protect us, thanks to you all! Been watching flightradar and the tanker V9U64 is still in north sea flying about in circles.Any reason/ideas why? The Control and Reporting Centre in control of those QRA aircraft would not allow supersonic flight overland without very, very good reason. It doesn’t happen for a practice. Ever! Not during the years I was the Fighter Allocator scrambling those jets and not now. Something needed urgent attention and it was rightly given. The floor shook here in Harrogate. The timing from FlightRadar24, compared with the original tweet reporting QRA launch, means the Typhoons launched before the AF flight started the turn towards the North Sea. Perhaps they only turned after they were intercepted. Often those that wish to be protected do not realise that to make an omelette you need to break eggs. Don’t forget to send Air France the fuel bill. Great job guys. Really reassuring to know your there to protect us. Just ignore the negative comments. You guys are brilliant. Thank you for all you do. was scared at first as we did not know what the booms was. i think everyone in Castleford was out lol. BUT may i just say it is so reassuring to know that you respond so quickly and professionally to keep us safe. great job guys and girls. please please be aware that we are so proud of you all. Is it possible to say where the first aircraft broke the sound barrier? It is not clear from the map. I live near NCL and it was a great few minutes to watch. Seeing the two typhoons dancing around in the sky was fantastic and pleasantly reassuring. Two of my family members is in the RAF and I have great respect for what they and there colleagues do.